In a small bowl, combine warm water, lemon juice, and gelatin. Whisk and let stand to soften for 1 minute. In a small saucepan, over medium heat, whisk together 1 cup whipping cream and sugar until sugar is dissolved and the mixture just reaches a simmer. Remove from heat. Pour warm hot mixture into a food processor or blender and add basil leaves. Puree until smooth. Strain the basil cream mixture through a fine mesh strainer into a large bowl. Add gelatin mixture, remaining 3/4 cup whipping cream, and yogurt to the large bowl. Whisk thoroughly until smooth. Pour the panna cotta into 8 small bowls, ramekins or serving dishes. Allow to cool at room temperature for 1 hour before covering and refrigerating. Allow to set up in the refrigerator for at least 4 hours (up to 1 day). For serving, remove from the fridge 5-10 minutes prior to serving and garnish with fresh blueberries and basil leaves. 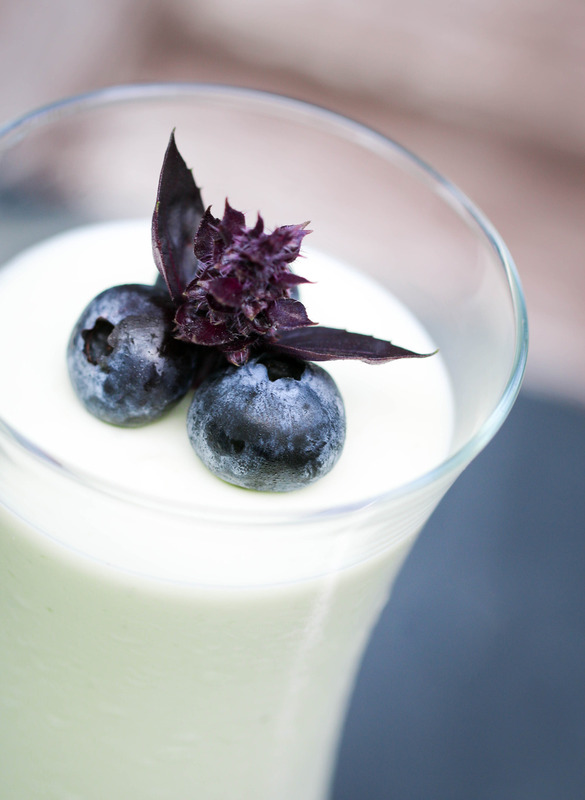 Note: These panna cottas are a wonderful canvas to experiment with flavors. Vanilla, mint, lime or lavender are all great alternatives to basil.